Harvesting Kale for CSA deliveries! My first lesson this summer: flexibility. As I drove up through Michigan to the Canadian border, I was anxious to reach Brooklands Farm – where I originally intended to spend my summer. But when I got to the border, they wouldn’t let me through (I didn’t have the right forms)! I quickly regrouped, and found White Pine Farm in North Branch Michigan, where Miriam and Dale kindly agreed to take me in on such short notice. While at first I was angry and panicked that my summer plans were “ruined,” I promptly realized that by being flexible I would salvage my summer and, hopefully, have even more experiences. And boy have I had experiences! I mastered basic farm tasks like watering, planting, weeding, harvesting, and packing. 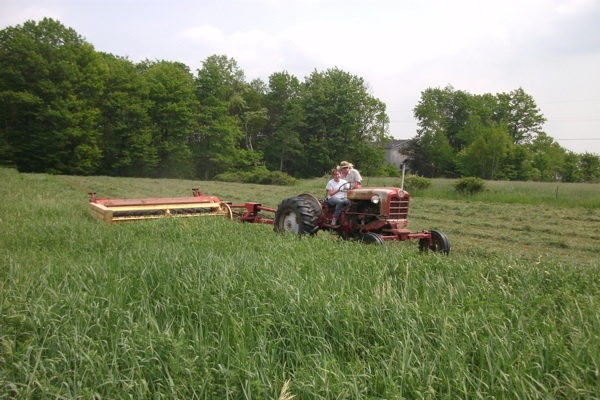 Under Dale’s calm guidance I drove tractors – creating raised beds and cutting hay. I set up main-line water irrigation, repaired an electric fence, and learned to drive a four-wheeler (ok, so that was just for fun). In a short amount of time I find myself almost totally adjusted to farm life – spending long days on my feet in the fields around animals, insects, and dirt. And I love it! Flexibility is also important for the farmer. While everyday has its basic chores (feeding cows, moving chicken tractors, watering, packing up orders, etc. ), weather conditions, unforeseen complications, and plant health determine a lot of what we do on a day-to-day basis. For example, since there has been a lot of rain in Michigan, many farmers have been unable to plant. Therefore, when a dry day does come along, they know exactly what to do that day. Additionally, some repairs have to be made as soon as a problem arises – like plugged hoses for watering plants and animals. Knowing what needs to be done and planning a farm is a job that takes first-hand experience. Work on a farm is never done, and a day (or a project) never goes exactly as planned. I have had to adjust to a new style of living (staying in a camper with semi-hot water) and working hard (I am sore and tired). So far, farming has taught me to adjust, relax, and make decisions based on the situation as it arises. Gardening Tip of the Week: Did you know basil plants keep away flies? That beans will not grow well near members of the onion family? Learn more about Companion Gardening with Louise Riotte’s wonderful book Carrots Love Tomatoes. Cooking Tip of the Week: Don’t have a dehydrator but always wished you could dry vegetables and fruits? Use your car! Just cut and blanch your produce (if necessary), place it on cookie sheets, and place inside your car. Roll the window down a crack and park it in the sun (this can also be done in an oven on very low heat). But be warned against drying onions or garlic this way – your car will smell for the rest of the season! 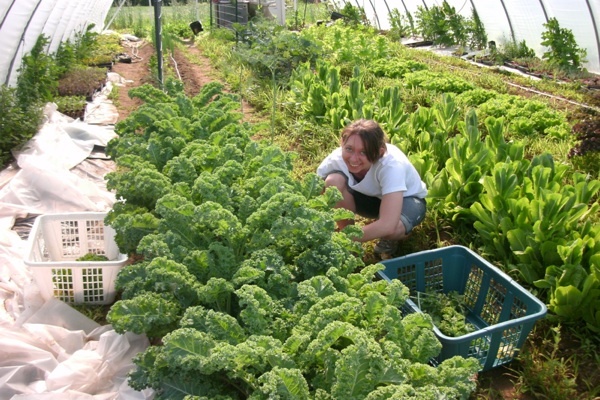 Alexis ZK is pursuing her interest in sustainable agriculture and local food by spending the summer working on a sustainable farm in Ontario, Canada. During the school year, she studies French and Food Studies at NYU, and fulfills her addiction to farmers markets. Follow her farming journey. « prev | Giveaway: Summer Popsicle Fun! Great post! Kudos to you, Pioneer Girl, for your ability to think on your feet and accept the abundance life has to offer on a daily basis. Great pics, too! They remind me of someone I know who grew up on a farm in Bucks County, PA.